The variety of house construction methods available, and the divergence of cusp locations they present, is often regarded as the most problematic component of modern astrology. With no clear authority to guide us, it is an issue upon which each astrologer must take an individual stance, weigh up the arguments, and resolve at a personal level. In view of such difficulties, it is hardly surprising that, as ancient astrologers strived for theoretical perfection, they settled for practical adequacy. This raises the question of whether we should, therefore, place so much emphasis on the working examples we possess that point to the use of simplified techniques. Throughout these ancient texts, we find regular reminders that, although students are taught by generalities, they must nonetheless take care to base their calculations upon the actual degree of the zodiac and not simply by sign position alone. No doubt, various points were simplified in order to elucidate other features of the chart, and one wonders whether these astrologers would have bothered to calculate complex mathematical formulas where the hour of birth had been rounded up in any case. More than anything else, it should be remembered that, when we query the methods of the ancients, the gaps in our knowledge are filled by conventional knowledge as it currently stands. It could be argued that any translation of terminology is largely a personal interpretation of the intent of an author, so we can never be entirely confident about the meaning of passages that refer to a lifestyle and a viewpoint we no longer possess. In this, I am as guilty as anyone else, but my summary is that the modern astrologer, seeking to resolve the problem of house division by reference to historical sources, will ultimately conclude that these sources do not, will not, and cannot provide an authoritative voice. The problem exists because there are so many valid frames of reference, and it is impossible to fully recognize the symbolic potential of them all within any one technique. So, we must make our selection according to where our own inclinations lie. When we individually accept this as part of our own responsibility for shaping the personal astrology that we use, then the problem of the houses ceases to exist. It can be seen as nothing more than the dilemma of choosing from the range of styles, techniques, and rulerships that runs through every other multifaceted branch of our art. 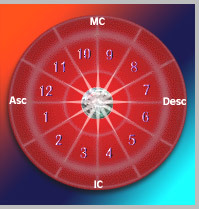 Our reliance upon houses comes from our desire to find a more personal relationship between the planetary positions as they shape themselves to the unique qualities of the space and time surrounding the chart. We must accept another level to this: that the truly personal relationship emerges from the central position of the astrologer, who strives to draw meaning and symbolic appreciation of celestial movements and cycles and, in this, holds true to the principles of astrology as a study that extends from astronomical principles rather than resting on them entirely.